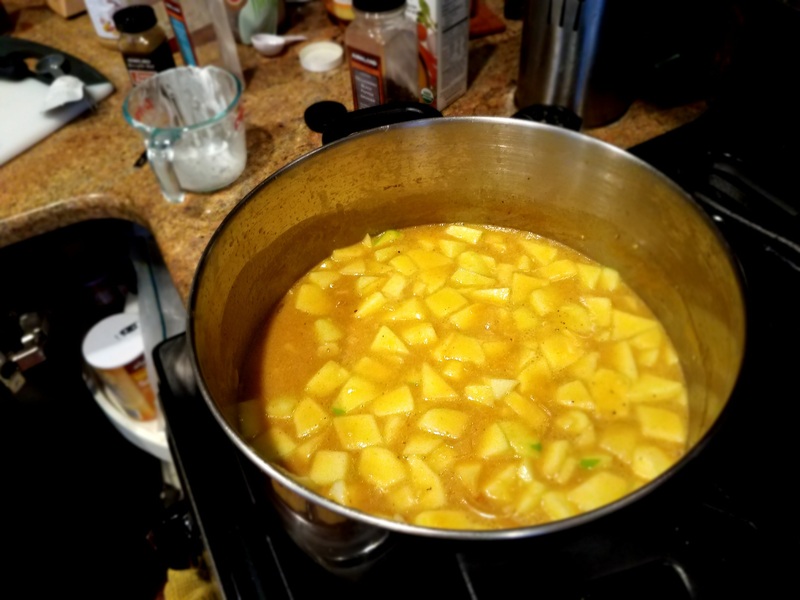 It’s got curry, coconut milk, chicken, onions, and Granny Smith apples…yes…apples. But you will want to give it a try. 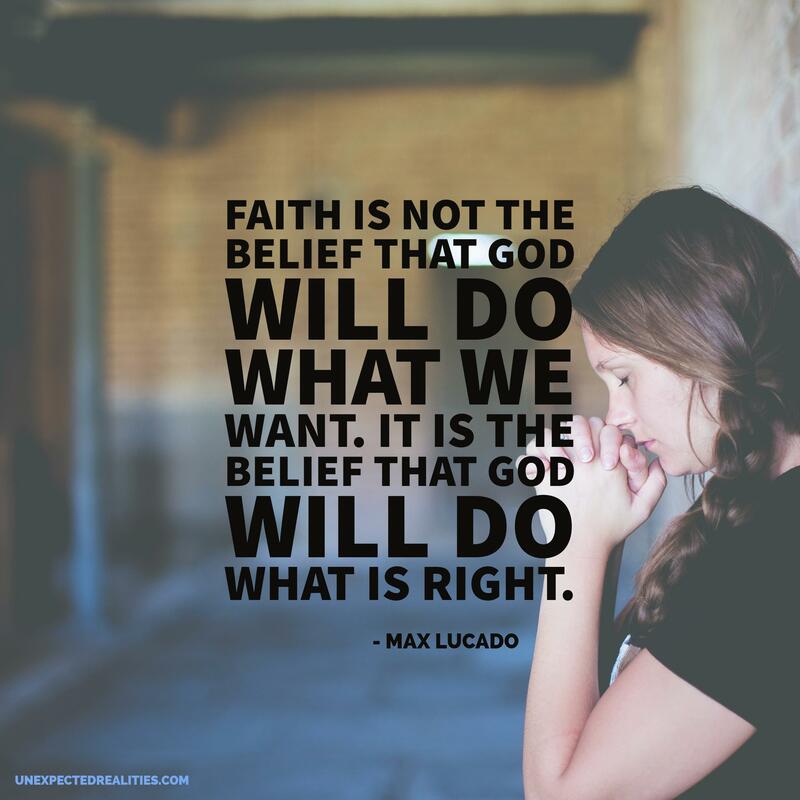 Trust me on this one! If you want a small cheat to go with this meal, you should grab a piece of warmed naan to dip into this soup. Gaahh, I want a bowl of this right now! The apples stay a little crisp, it has a perfect amount of spice, and the coconut milk does not detract from the original recipe at all. In fact, traditional mulligatawny would have coconut milk, so really I’m just making a more authentic recipe! Mulligatawny is another good example of how the English adopted Indian food since it was way better. 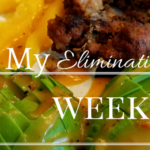 This is a modified version of The Pioneer Woman’s recipe that we have been enjoying for years. The Pioneer Woman was an inspiration for me when I was starting to get into cooking after I was married. I love her recipes, have all her books, and stood in line for two hours once to meet her. But she isn’t exactly a shining example of a healthy diet (nor does she claim to be), let’s be honest, she’s the current spokesperson of Land O’Lakes right now. 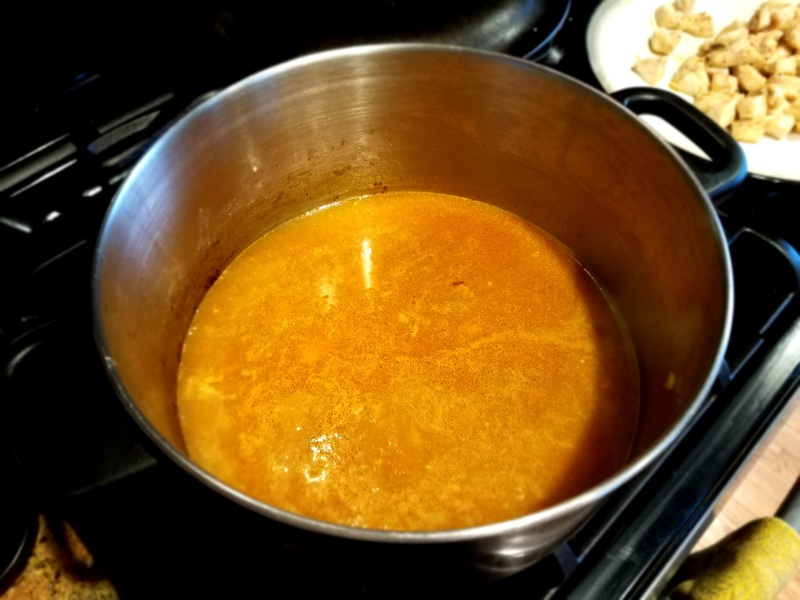 Since I am avoiding dairy and wheat, her recipe wasn’t going to work for me anymore (two cups of half and half…oh dear.) 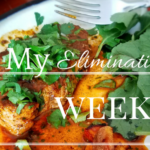 So I came up with this paleo version so that we could still enjoy this delicious and satisfying soup! 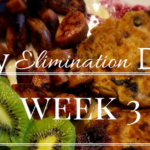 If you are more strict paleo than I am, then the coconut sugar may not work for you, but if you are focusing on ridding your diet of refined sugars then this is a good transition recipe. 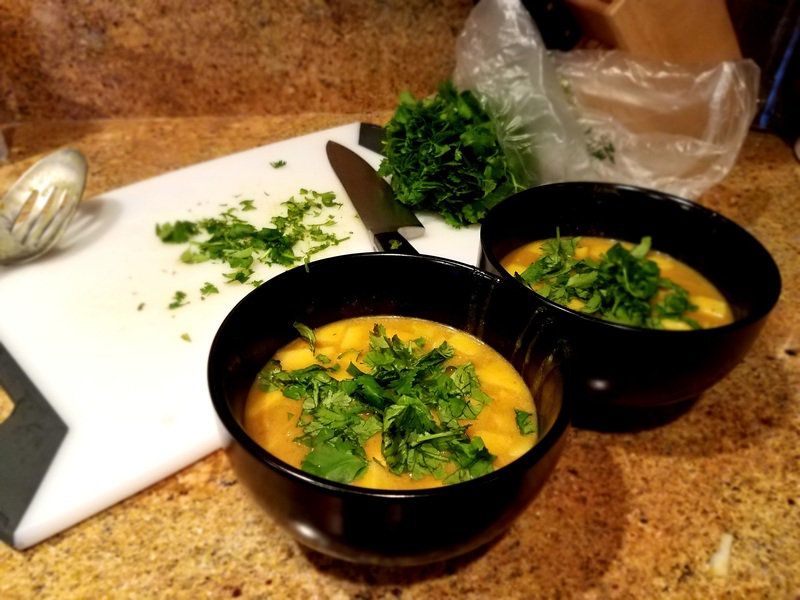 We have been having an especially cool spring, which has given me some extra opportunities to make our favorite cold-weather soups, including this healthy version of mulligatawny. Some of our other favorites this spring have been Chicken Avocado Lime Soup, Easy Organic Lamb Stew, and Paleo Chicken Tortilla Soup. This soup calls for a good ‘ol California Chardonnay. The kind that isn’t afraid too still have a genuine creamy taste with a medium balance of fruit. Yes, there are wines that still accomplish this — might I suggest one of my favorites, the Muirwood Chardonnay? Start be getting out all your ingredients. 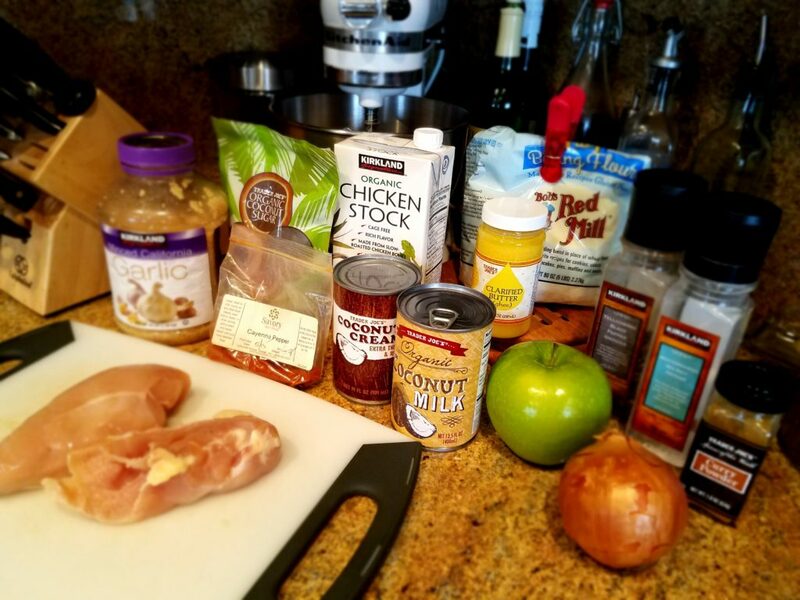 You will need chicken, a granny smith apple, chicken stock, coconut milk, olive oil, ghee, onion, garlic, coconut sugar, curry powder, salt, pepper, and cayenne pepper. Can you tell I’m a fan of Costco and Trader Joes? 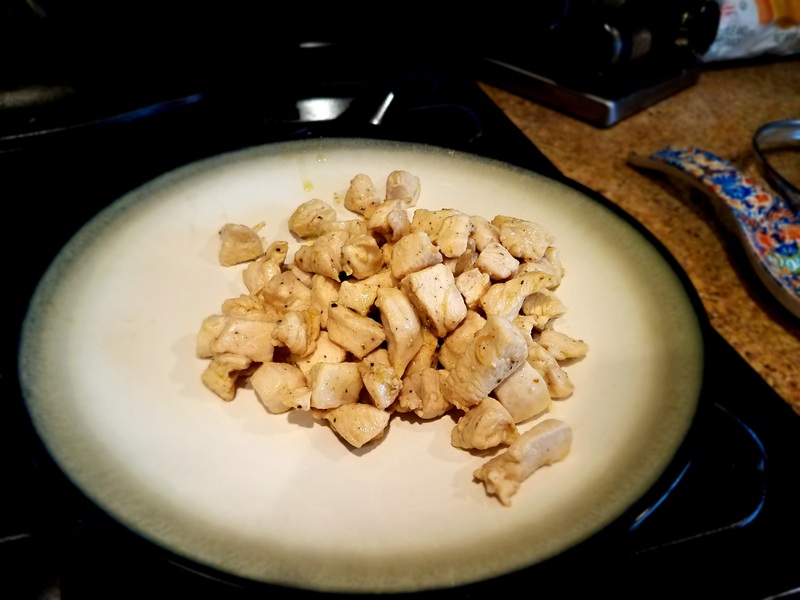 Cut off any fat from your chicken breasts and chop them into small pieces. Sprinkle with fresh ground salt and pepper. In a large pot or dutch oven, add 2 tbs of olive oil and let it warm up in a pan over medium to medium high heat. Add in the chopped chicken and let it cook for about 5 minutes, until the chicken has browned. While the chicken is cooking, chop up a large yellow onion. When the chicken is done cooking, remove it from the pan and set it aside. Add 2 tbs of ghee (clarified butter) to the pan. Add in the onions and minced garlic and stir to combine. 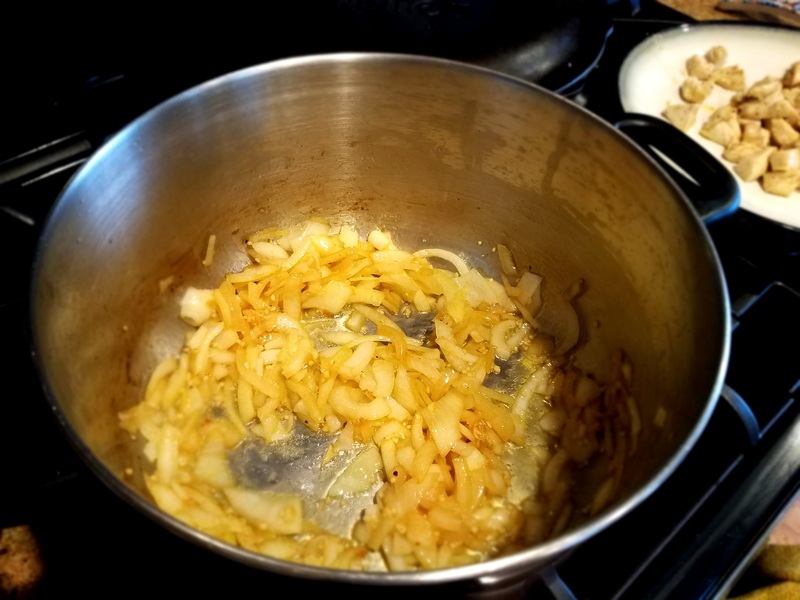 Let it cook for a few minutes until the onions are softening and starting to brown. 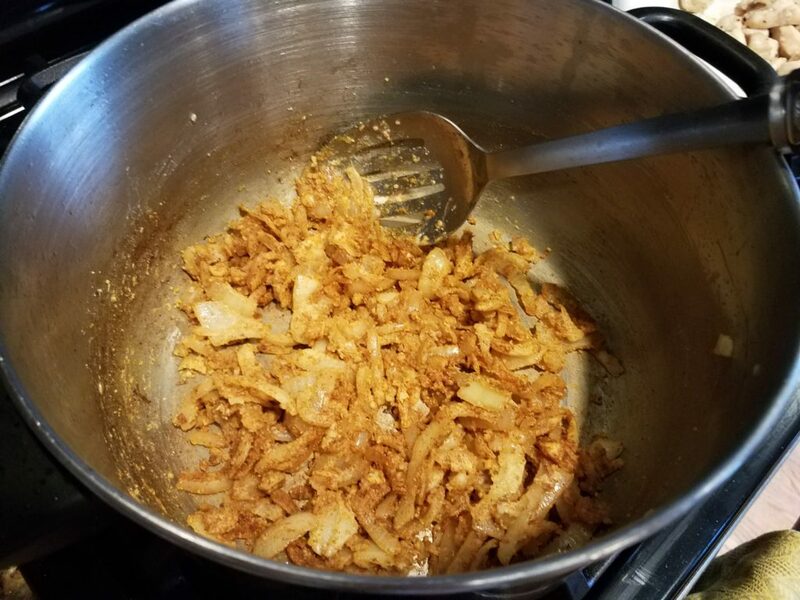 Measure out 1/4 cup of gluten free flour while the onions cook. 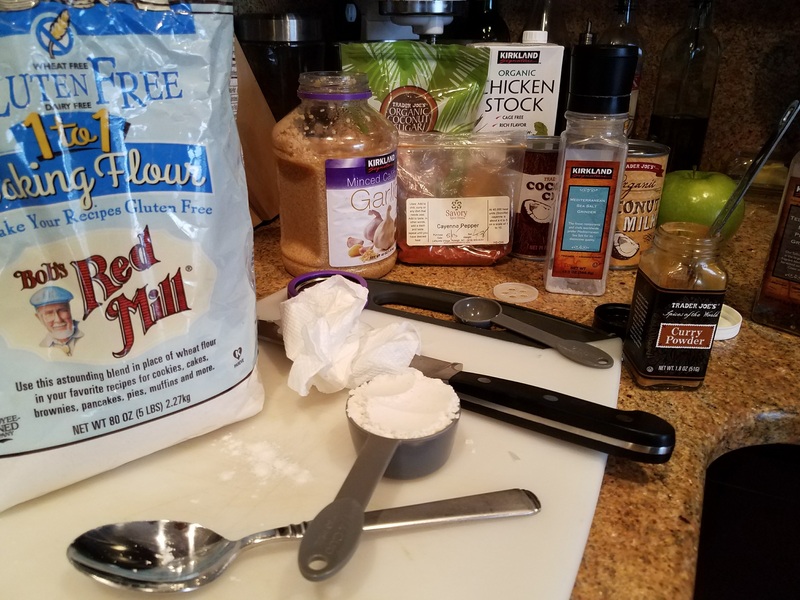 This is the gluten free flour I have been using to replace all-purpose flour, and haven’t noticed a difference using it. Get ready to measure out a tablespoon of curry powder too. Sprinkle the flour over the cooking onions and stir. Then, add the curry powder and continue stirring for a minute to completely coat the onions. Next, take your package of chicken stock and pour it over the onions. Scrape up all of the goodness at the bottom and cook for another 5 minutes. At this point you can add in the coconut milk, coconut sugar, salt and pepper, and cayenne. Stir and cook for 5 more minutes. 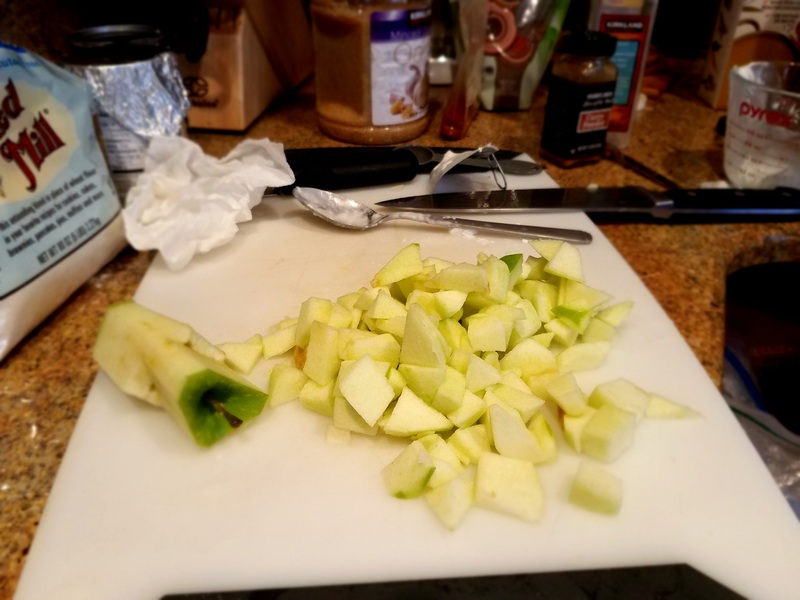 While the broth is cooking, peel and chop a large Granny Smith apple. Add the reserved cooked chicken and the chopped apples to the pot. I usually let this cook for about 7 minutes. After it’s done cooking, remove the pot from the heat and let it sit for about 5 more minutes to thicken. 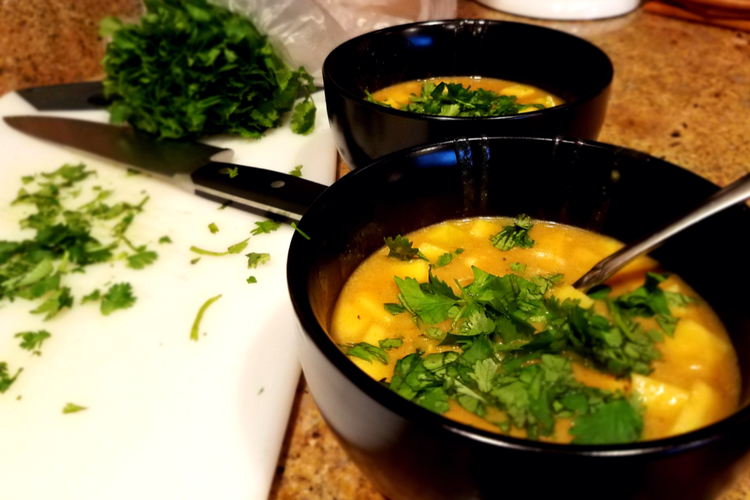 The last step is to chop up some cilantro and add a generous portion on top of each bowl of soup. The cilantro is a perfect accompaniment to the soup and balances out the (slight) spice. Your glass of chardonnay will help with that too. 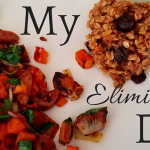 Stir in your cilantro and dig in! This soup is great for leftovers. 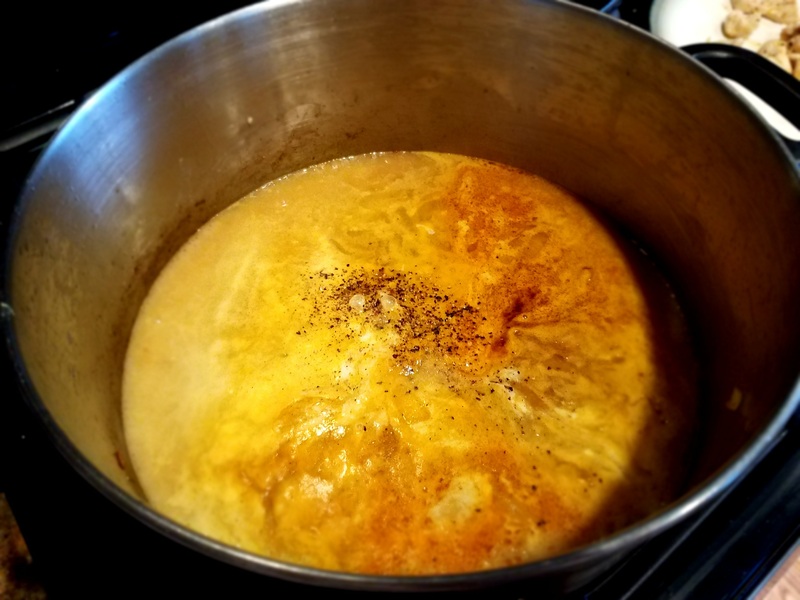 If you are so inclined, this soup goes great with a piece of naan bread. Mmmm. Bread, why are you so good. 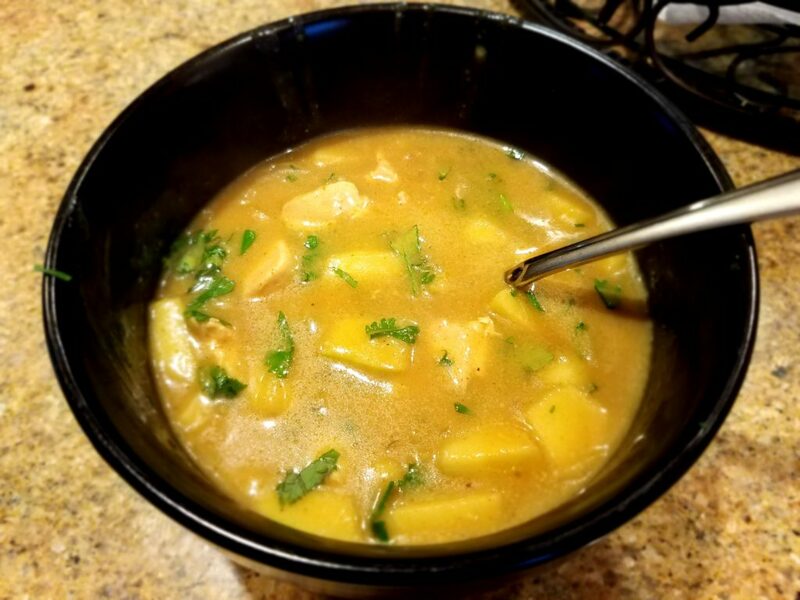 A creamy soup made with coconut milk, chicken stock, chicken, and granny smith apples that has a slight kick from the cayenne and a delicious flavor from the curry. 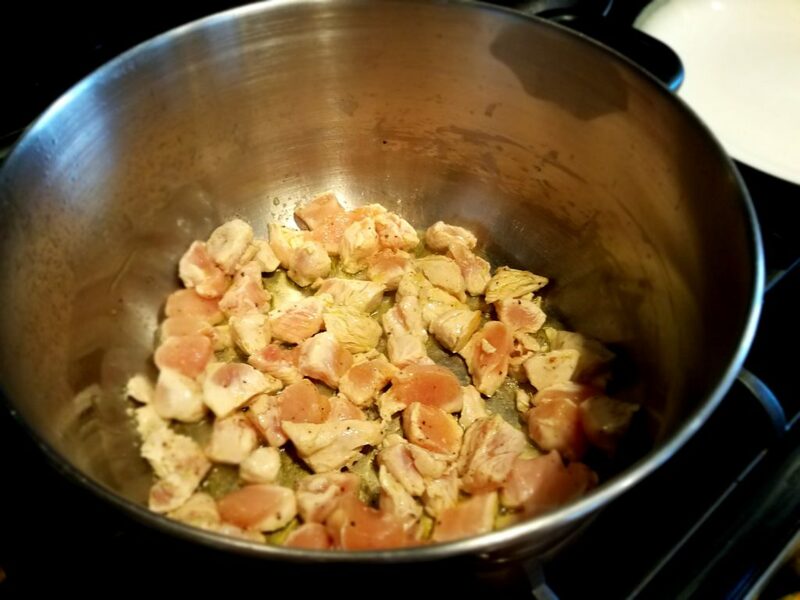 Take a pound of chicken and chop it into bite-sized pieces. 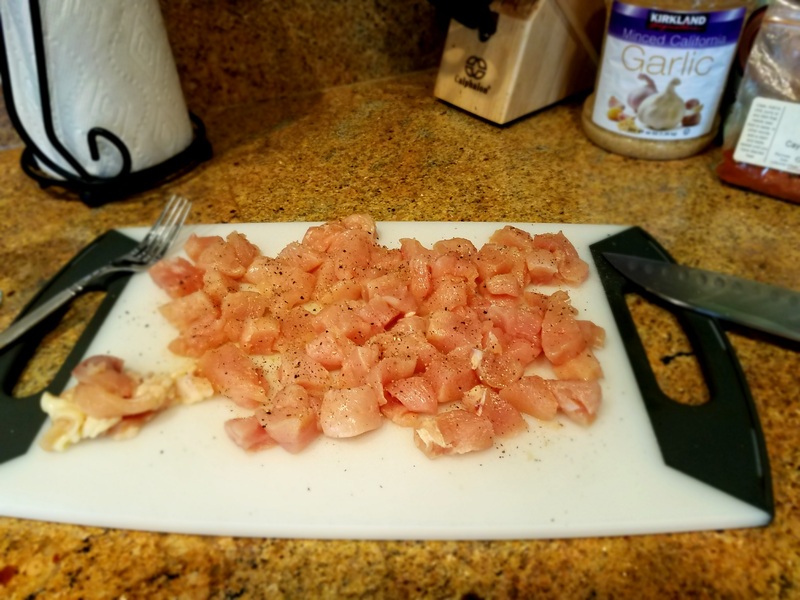 Season the chicken with fresh ground sea salt and pepper. Add 2 tablespoons of ghee to a large pot and let it warm up over medium high heat. Add the chicken to the pan and let it cook for about 5 minutes or until browned. When the chicken is done cooking, remove it from the pan and set it aside. 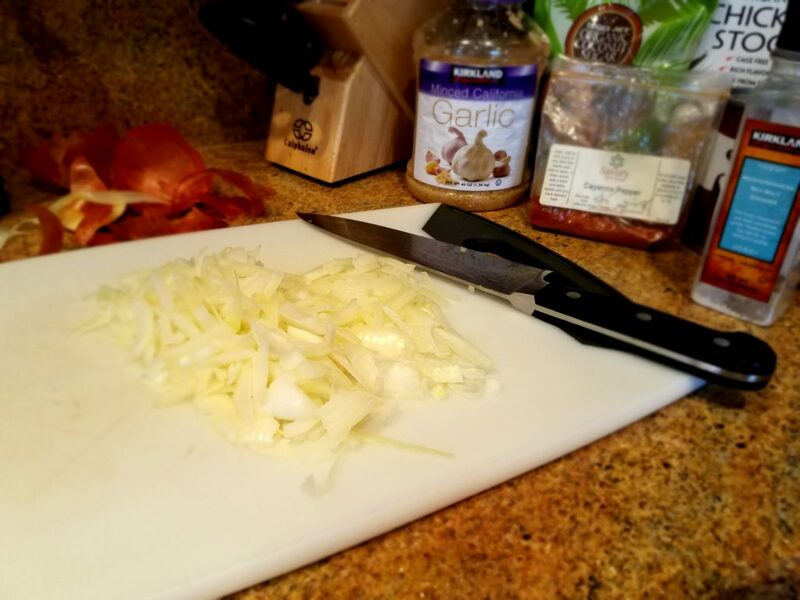 While the chicken is cooking, chop up a whole large, yellow onion. After you have removed the chicken, add 2 tablespoons of olive oil to the pan. Add in the chopped onions and the garlic, stir together and let them cook for a few minutes. Next, sprinkle the gluten-free flour over the onions and stir with a wooden spoon to combine. Add in the curry powder and keep stirring for one minute. Pour in the chicken stock over the onions and scrape all the goodness from the bottom of the pan. Let it cook for 5 minutes. Pour in the coconut milk, coconut sugar, cayenne pepper, and salt and pepper and cook for 5 more minutes. Add the chopped apple and cooked chicken to the broth and let it cook for about 5 more minutes. When it's done, turn the heat off and let the soup sit for at least 5 more minutes while it thickens. 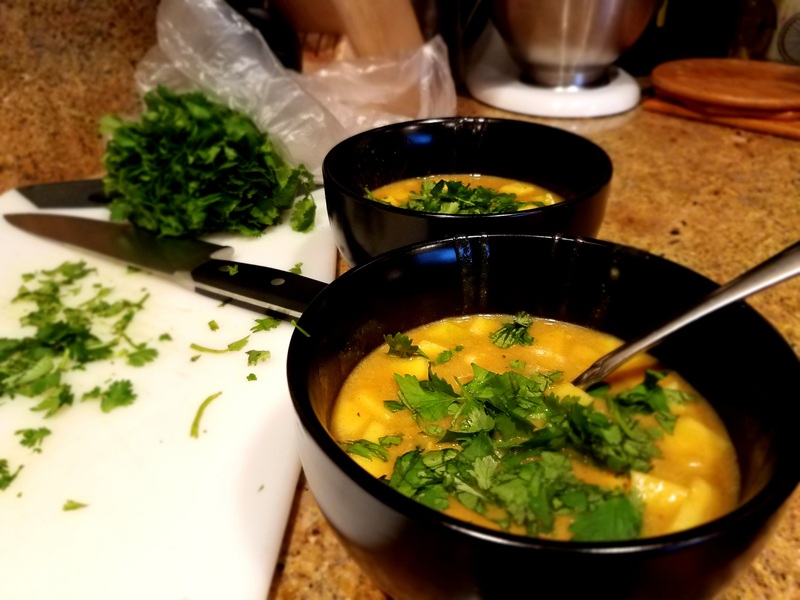 Finally, spoon the soup into bowls and top with a generous portion of cilantro.